I am preparing new posts to continue on with exposing what creations went on in December. We’ve been working on remodeling an apartment and I promise that crafting WILL go on! I want to blog an announcement. I stepped off into a journey with a few plurk friends to make a marked difference in my life this new year. 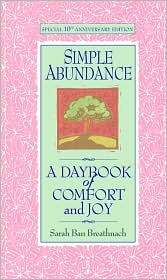 I’ve been following the readings and path of the bookSimple Abundance: A Daybook of Comfort and Joy, by Sarah Ban Breathnach. I started mid way of January and it has had a TREMENDOUSLY POSITIVE affect on my daily life so far! Here’s the book: Maybe you’d like to join along? I want to keep this blog feed dedicated to crafting, so I’ve created a separate spin-off site to house all my Simple Abundance posts.